One of the most frequent questions we get is about our floor cloths. We think they are a unique and fun way to display and use special fabrics. 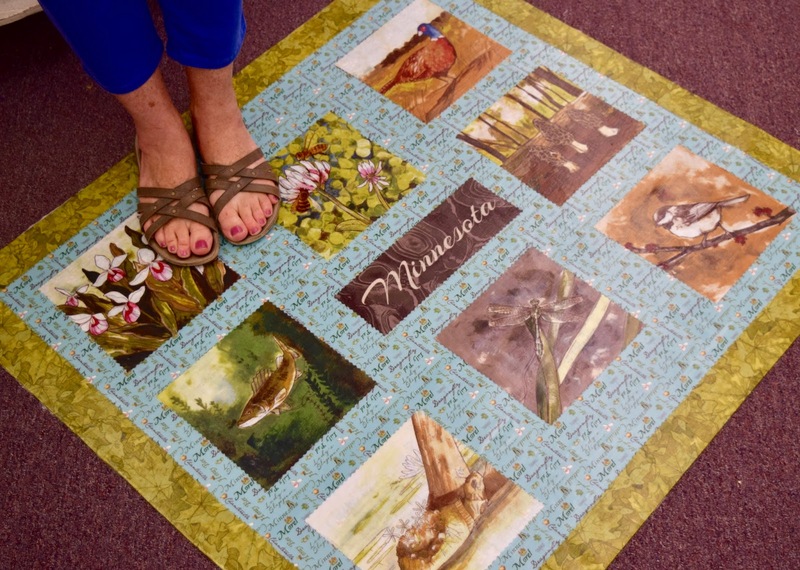 Debbie makes a new one every year for the MN Shop Hop. We keep it on the floor right in front of our cash register counter, a place that gets lots of traffic. It gets walked on all the time, and lasts through wet shoes, sandy shoes, slushy shoes and salty shoes. We've shared the instructions on this blog before so I will reprint them here. We also hand out those instructions to anyone in the store who is interested. You can make your own floor cloth to the size that you want, from big all the way down to coaster size! The multi-purpose cloth (by Roclon) that is the foundation for our floor cloths is 54" wide. That would be the max width of a floor cloth but the length could be longer than that because we buy it on a roll and sell it by the yard. If you are planning to make your own floor cloth, the usual size container of Mod Podge is not enough. You are better off to watch for it on sale at a craft store and buy the big container. You can get as creative as you want with fabrics in assorted colors, shapes and sizes. You can make it look like quilt blocks, or a collage, or a Van Gogh!